Feature Your Event on DMVLIFE.com!!! Only $20 will get your event listed in the DMV Events section on DMVLIFE.com! 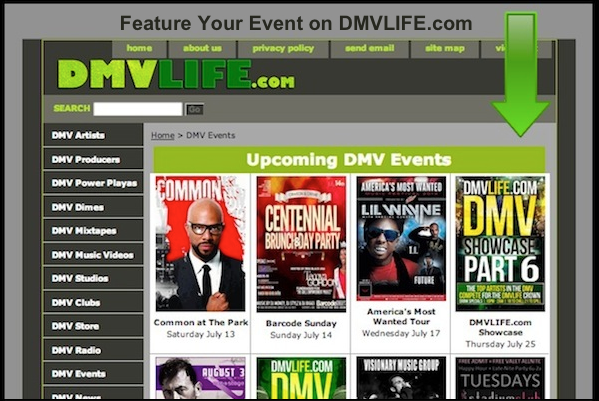 The DMV Events section on DMVLIFE.com is the hub of all music events in the DMV. People from all over the DMV use the DMV Events section to find out about upcoming events. Make the payment below and your upcoming event will be added to the DMV Events section on DMVLIFE.com within 48 hours. We will also post the event to our Facebook page and tweet it out to our followers. Send out an Email Blast about your event! If your goal is to reach as many people as possible you will want us to send out an email blast about your upcoming event. The recipients of our emails are DMV artists, producers, bloggers, websites, DJs, and fans of DMV music. The people we send our emails to have been confirmed members of our email list so you can be assured that you are reaching quality contacts. DMVLIFE.com generates over 200,000 page views and attracts over 80,000 unique visitors per month. You can use a banner ad to reach them. Over 90% of the visitors to DMVLIFE.com live in the DMV! With our focused demographic, you can be assured that you will reach thousands people all over the DMV. 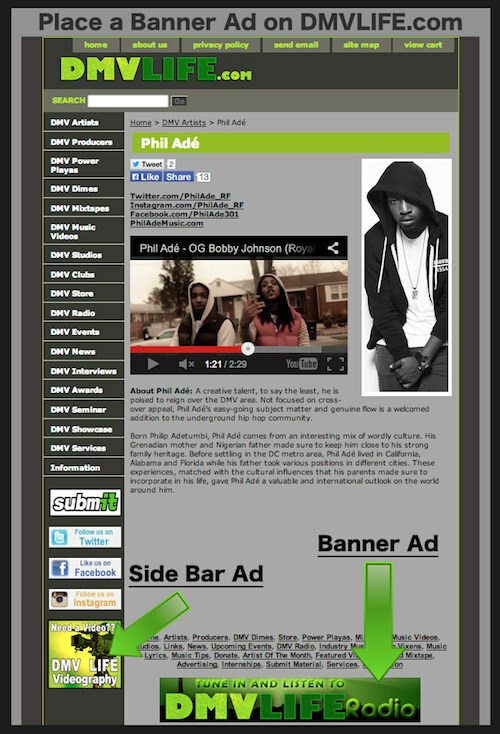 Use a banner ad to spread the word about your new music, company, event, or whatever you are promoting. DMVLIFE.com can also sell tickets to your event. Help get the most money and people to your event by pre-selling tickets on DMVLIFE.com. Contact us today at, events@dmvlife.com to set up ticket sales for your upcoming event.